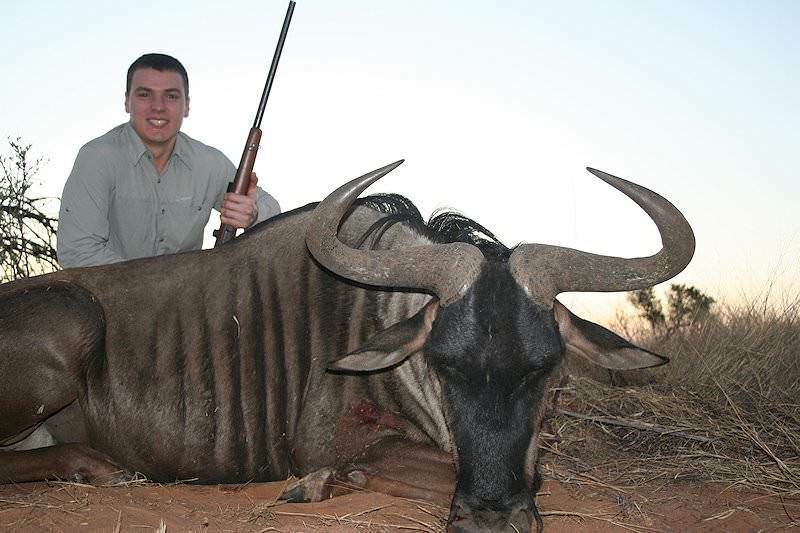 Most trophy hunters that visit South Africa take home at least one blue wildebeest. 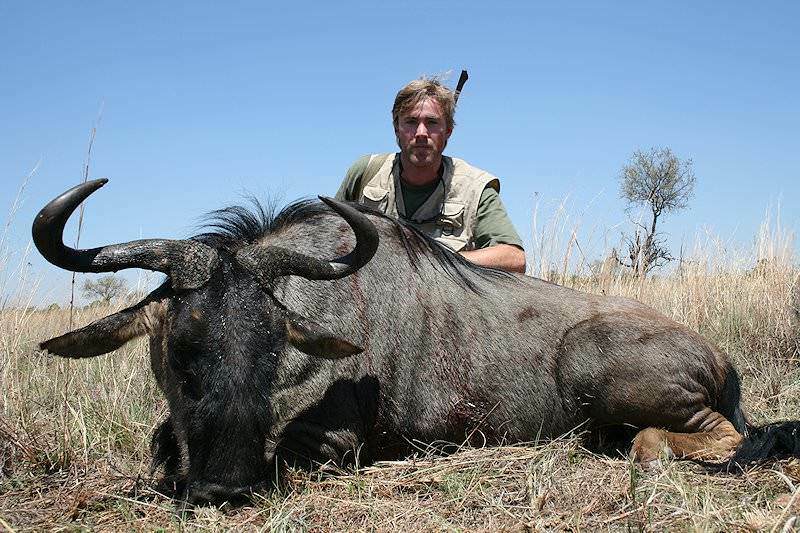 Hunting blue wildebeest, or the brindled gnu, as he is also known, can be most exciting. 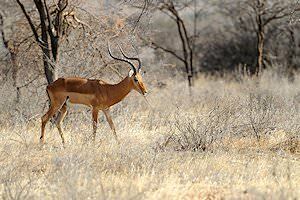 This large, bearded antelope, native to the acacia savanna and short grass plains is often referred to as the 'poor man’s' buffalo. His numbers have dwindled somewhat in many of his old habitats, but he is as plentiful as ever on the Serengeti ecosystem where his numbers may well exceed one million. 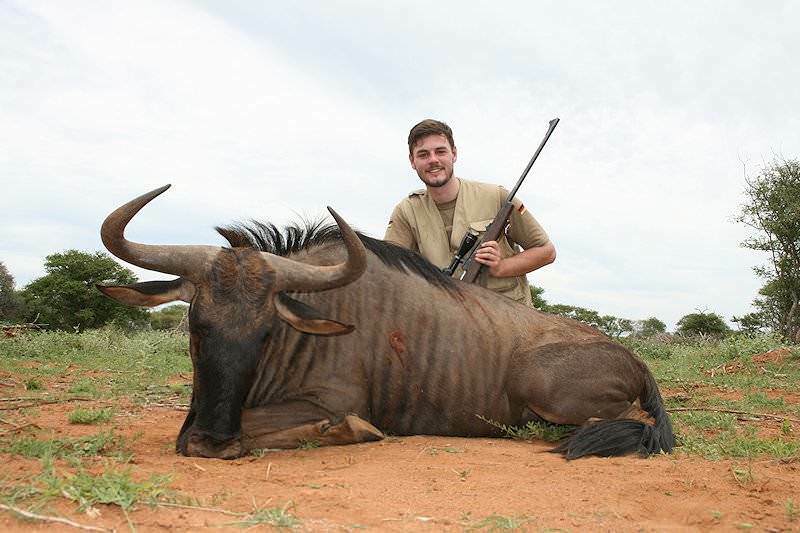 The game ranches of southern Africa maintain managed populations of this 'beest', which offer wonderful opportunities for hunting blue wildebeest. As both sexes carry horns and are of similar body size and color, sorting out the bulls from the cows can sometimes be difficult. 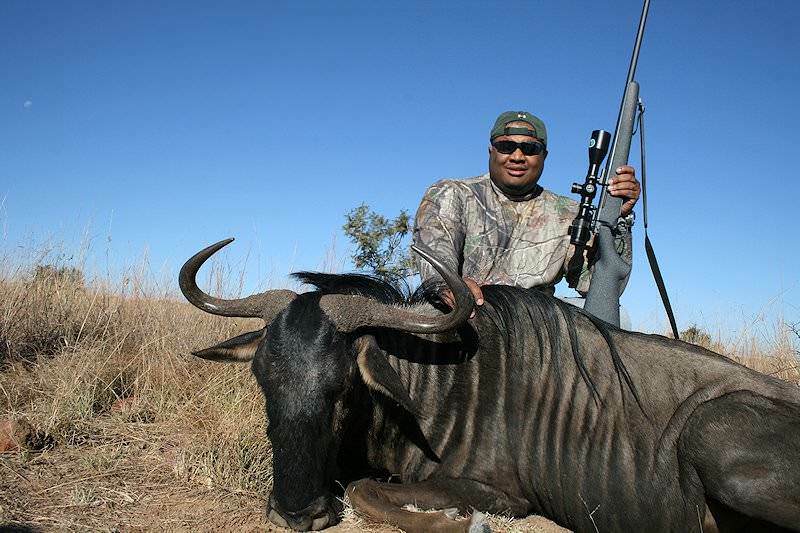 Look for heavier muscled individuals with thicker horn bases and more droop. Older bulls will usually appear darker in color with wider stripes. Mature bulls can weigh as much as 600 pounds. 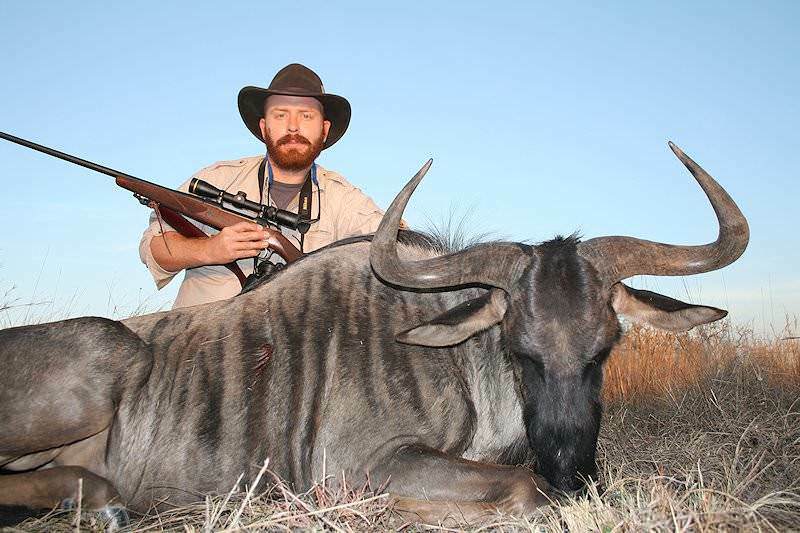 On the open plains, the wildebeest is easy to locate from a distance, however, hunting blue wildebeest in the bushveld is quite another story. 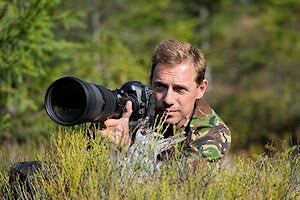 In the bush, he can be elusive and shy; a good technique is to walk slowly into a suspected resting area into or across the wind glassing well ahead for movement. 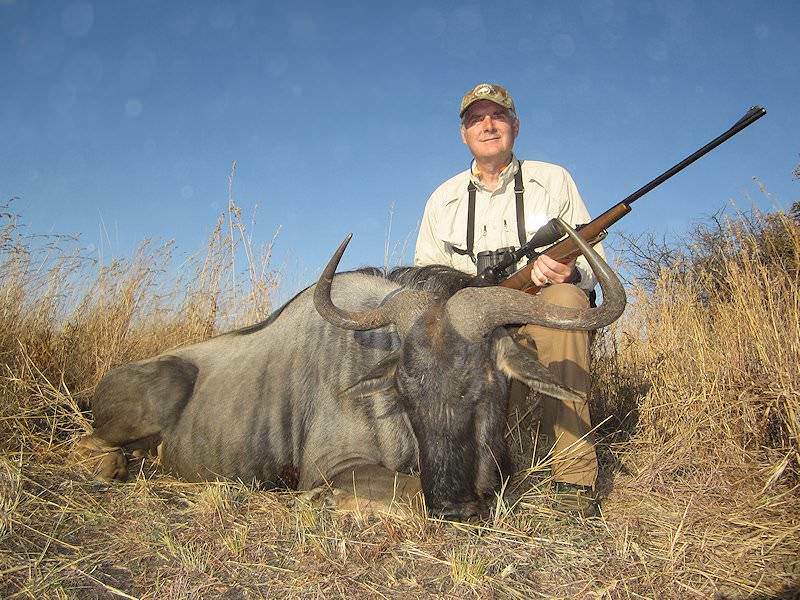 This is one tough antelope; hunting blue wildebeest with less than .270 caliber and a good 150-grain bullet is not recommended. In open country, the flat shooting .300 magnums with 200 or 220-grain bullets are an excellent choice. 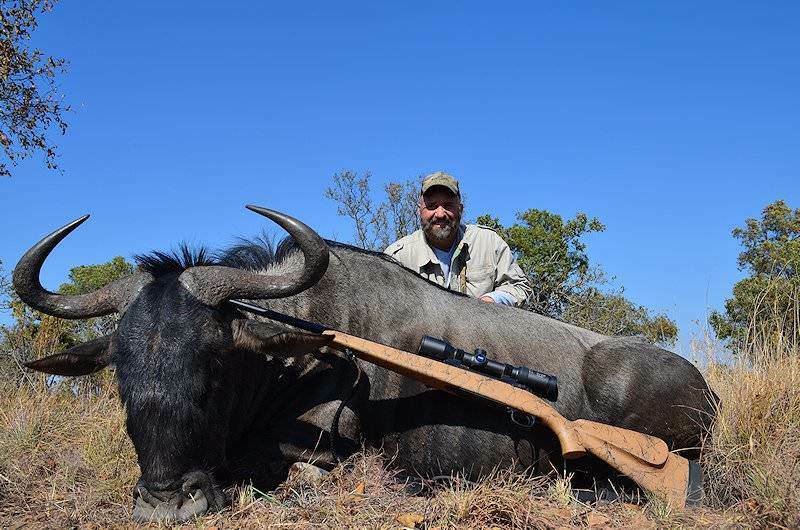 Hunting blue wildebeest in bushveld conditions may well call for even larger calibers and heavier bullets. The prominent hump on the shoulder and the mane may often lead to a body shot placed too high. 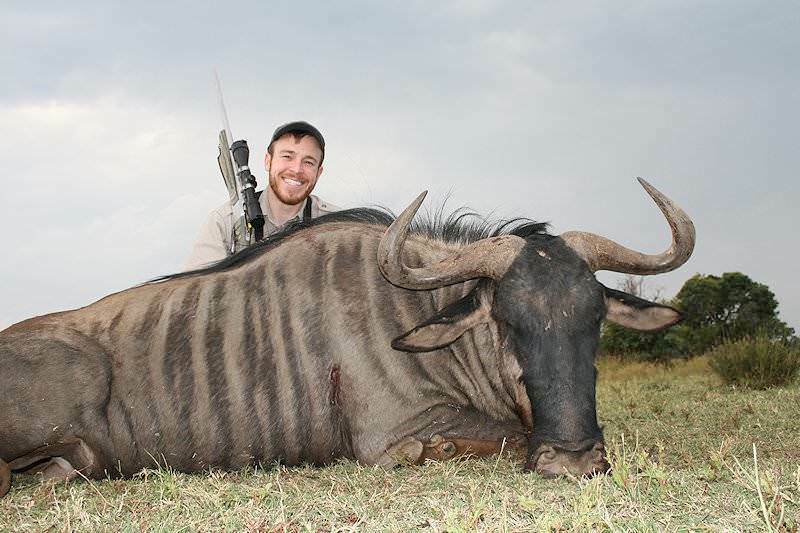 When hunting blue wildebeest, always try to position yourself for the side-on shot; draw up the back edge of the front leg and place the shot about four inches (a hand’s width) above the point of the elbow. 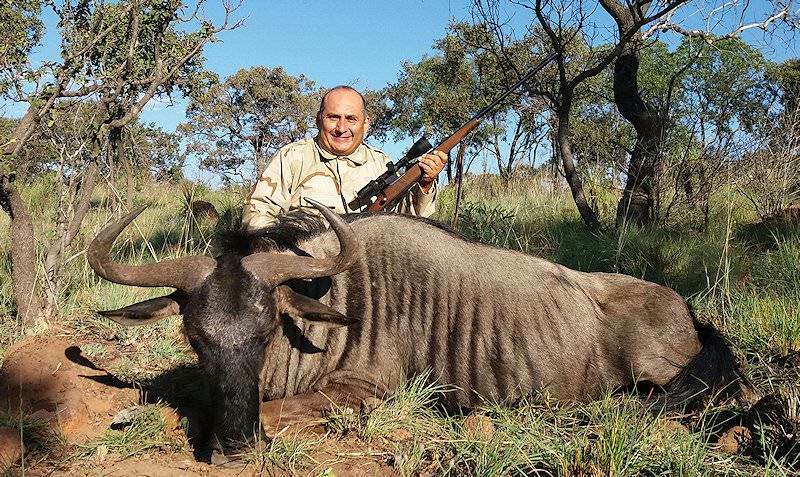 This 'high heart' shot will take heart and lungs; the animal will rock to the shot and probably go down within 50 yards. If your shot placement is not quite on the mark, be very cautious in a follow-up. This critter can be extremely dangerous when wounded. 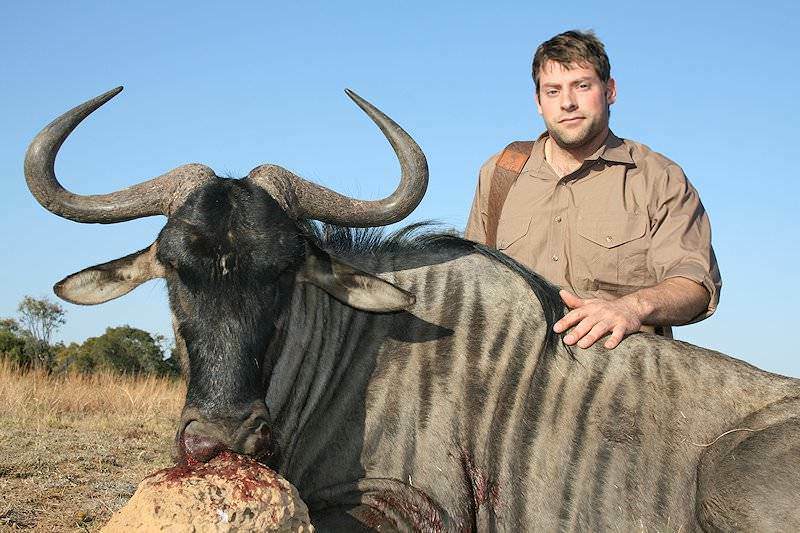 Approach a downed wildebeest from the 'off' side with great care, as they have been known to get up and charge. 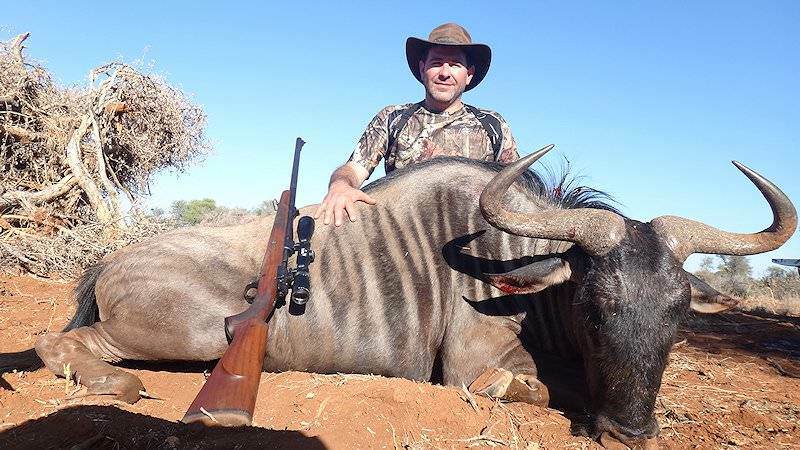 By far our most popular South African hunting package, this five-day bushveld adventure is a fantastic introduction to hunting for African plains game. 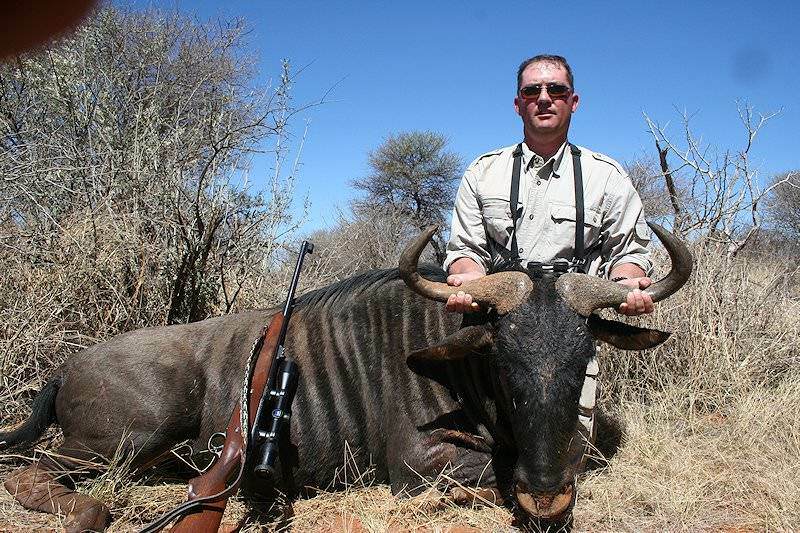 The bag includes sought-after species like blue wildebeest, blesbok and impala. 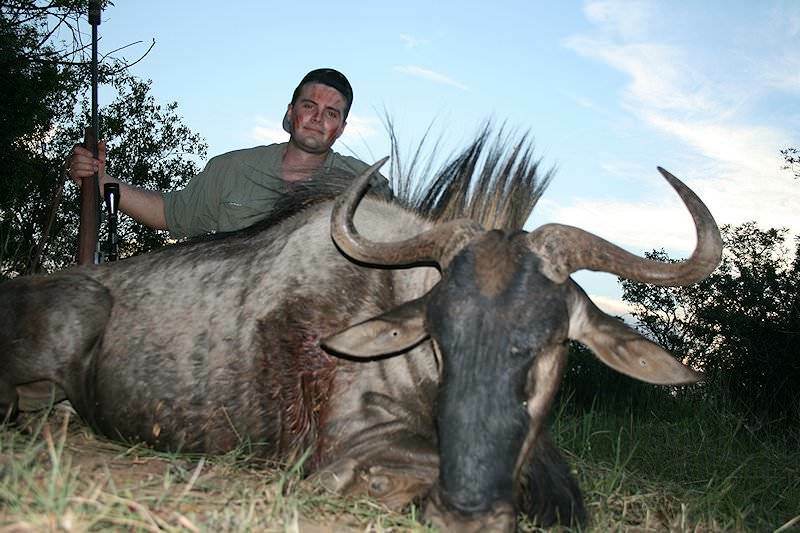 A more in-depth bushveld hunting adventure for hunters with time on their hands or specific species in mind. 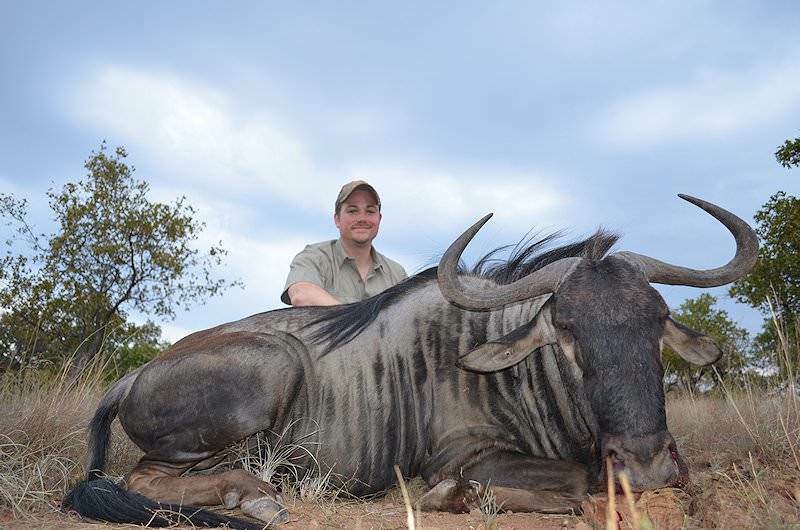 The package includes five incredible plains game trophies: kudu, blue wildebeest, Burchell's (common) zebra, impala and warthog. 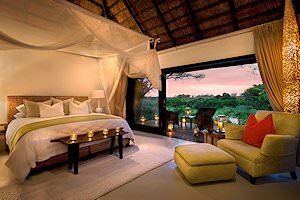 The two quintessential African safari experiences in one fantastic value-for-money package. 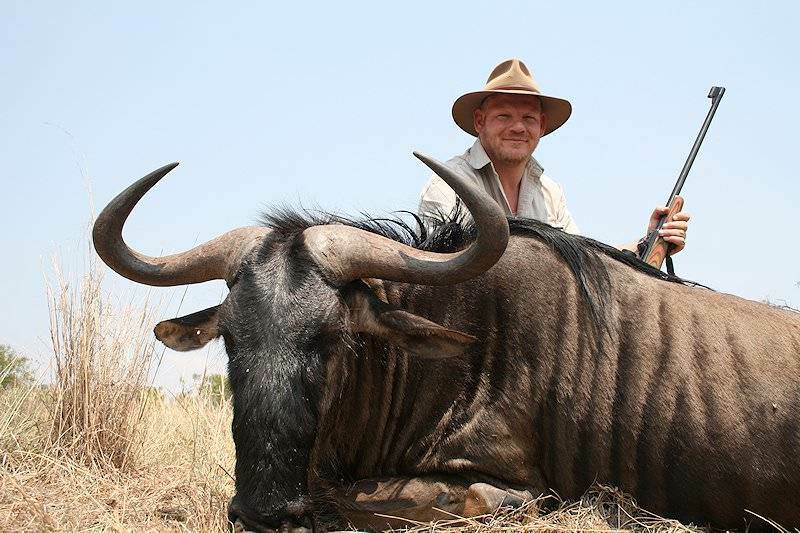 Hunt for zebra, blue wildebeest, impala and warthog before spending a few memorable days on a privately guided overland safari in the Kruger National Park. A hunting experience to be treasured for a lifetime. 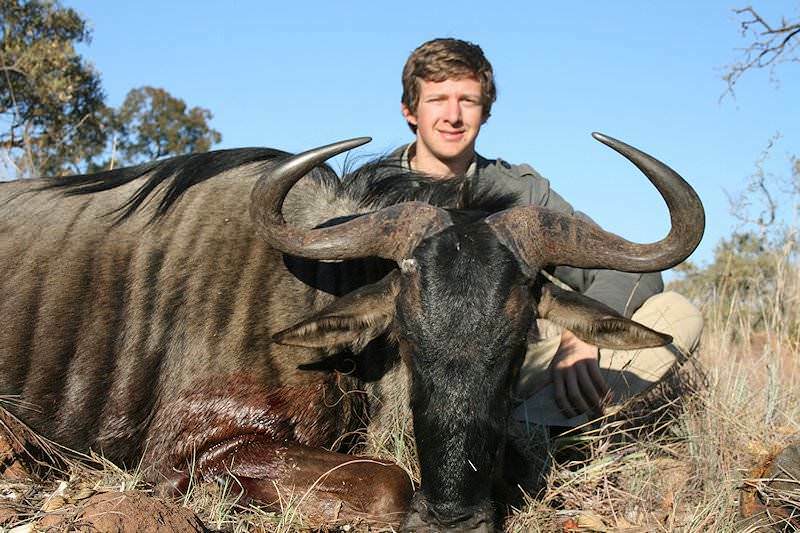 This father-and-son package presents an opportunity for bonding and taking home some highly sought-after plains game trophies, including kudu, impala, blue wildebeest, zebra and gemsbok. 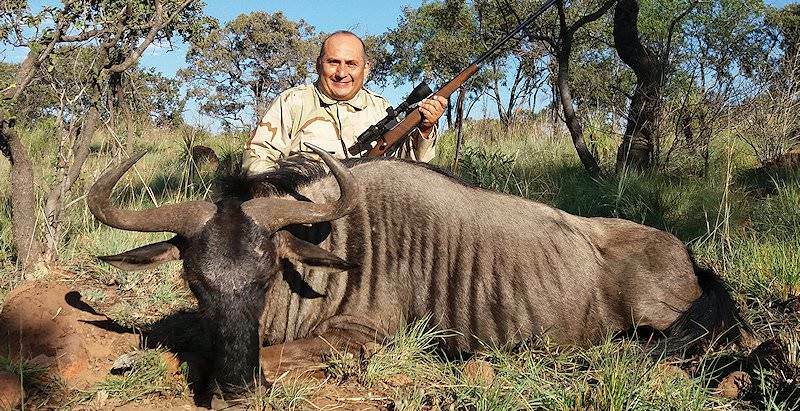 Two weeks of epic hunting pursuits in South Africa's most rewarding hunting regions - the iconic bushveld and the grassy plains of the eastern Free State. 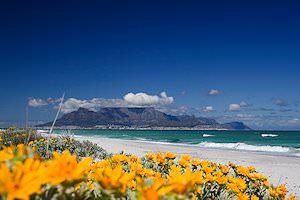 The package includes seven species: kudu, impala, blue wildebeest, black wildebeest, blesbok, springbok and zebra. 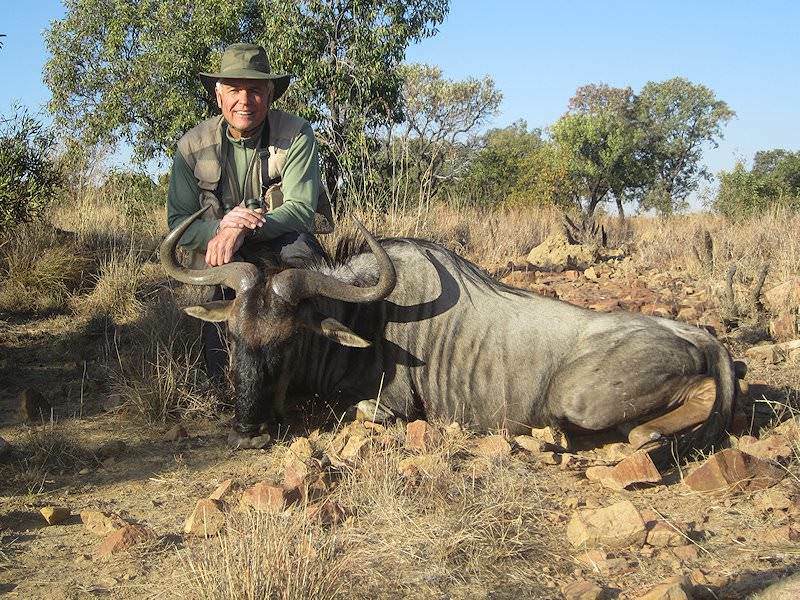 Our most comprehensive hunting package, this 21-day experience includes South Africa's top plains game pursuits and three stunning hunting areas. 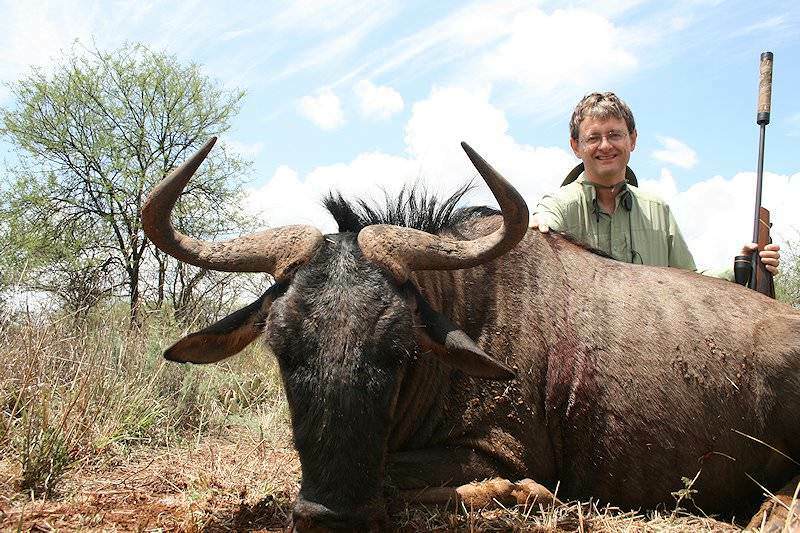 Hunt for animals like kudu, blue wildebeest and gemsbok in the bushveld, Free State and Eastern Cape.